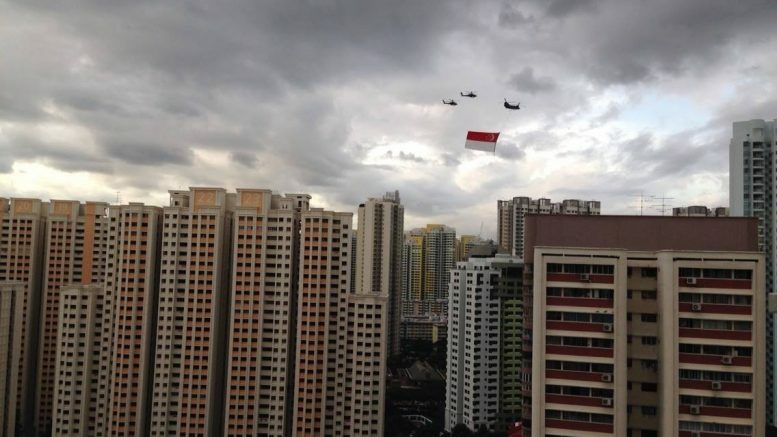 On Singapore’s National Day, 9 August 2014, helicopters fly the flag toward the National Day Parade. Singapore’s shares will start trade with positive leads from Wall Street and early Asian trading amid relief over the outcome of the U.S. midterm elections, which saw the Republican party lose its stranglehold on power in the federal government. The lead from Wall Street was positive after U.S. midterm elections yielded a divided Congress, with Democrats retaking control of the House of Representatives and ending the Republican power block. “Everyone is hoping that we’ll see a more collaborative attitude by the president and the Democrats as they recognize each other’s powers to promote or stifle policy progress,” Kathy Lien, managing director of foreign-exchange strategy at BK Asset Management, said in a note on Wednesday. But there could be some headwinds from subsequent developments. U.S. President Trump requested and received a resignation from U.S. Attorney General Jeff Sessions, in a move which some analysts were calling a firing. The long-speculated-over development carries potential headwinds for the investigation into Russian interference in the 2016 U.S. elections and the Trump campaign’s ties to that interference. Trump had spent more than a year publicly haranguing and sometimes insulting Sessions over the Attorney General’s decision to recuse himself from the Russia probe after Sessions was found to have ties to Russian subjects of the probe. It also comes amid speculation that the long-expected subpoena of Trump in the investigation may already have been issued. Japan’s Nikkei 225 index was up 2.14 percent at 8:24 A.M. SGT, while South Korea’s Kospi tacked on 1.79 percent by 8:29 A.M. SGT. Singapore’s Straits Times Index ended Wednesday up 0.16 percent at 3065.36; November futures for the index were at 3067 on Wednesday, while December and January futures were at 3065 and 3067 respectively. Hong Kong’s Hang Seng Index rose 0.10 percent to 26,147.689 on Wednesday, while China’s CSI 300 shed 0.66 percent to 3221.91. Malaysia’s KLCI rose 0.36 percent to 1714.88 on Wednesday, while Indonesia’s IDX Composite added 0.27 percent to 5939.89. The Dow Jones Industrial Average climbed 2.13 percent to 26,180.30, the Nasdaq Composite increased 2.64 percent to 7570.754 and the S&P 500 advanced 2.12 percent to 2813.89. Futures for the three indexes were nosing into the red in early trade. The U.S. dollar index, which measures the greenback against a basket of currencies, was at 96.16 at 7:05 A.M. SGT, that was after starting Wednesday’s session around 96.15, then falling as low as 95.65 before retracing its steps, according to ICE futures data. “The U.S. dollar initially drowned in a wavelet of blue, but later gained momentum as risk sentiment remained supportive,” Stephen Innes, head of Asia Pacific trading at OANDA, said in a note on Thursday. The 10-year U.S. Treasury note yield was at 3.235 percent at 8:23 A.M. SGT, up from around 3.190 percent early on Wednesday, according to Tullett Prebon data. The euro/dollar was at 1.1432 at 8:24 A.M. SGT after trading in a 1.1393 to 1.1500 range on Wednesday, according to DZHI data. The dollar/yen was at 113.61 at 8:25 A.M. SGT after trading in a 112.92 to 113.818 range on Wednesday, according to DZHI data. The dollar/yuan ended at 6.9173 on Wednesday after trading in a 6.9118 to 6.9408 range during the session, according to DZHI data. The dollar/Singapore dollar was at 1.3716 at 8:26 A.M. SGT after trading in a 1.3679 to 1.3762 range on Wednesday, according to DZHI data. The dollar/Malaysian ringgit was at 4.1670 at 8:25 A.M. SGT after trading in a 4.1630 to 4.1730 range on Wednesday, according to DZHI data. The dollar/Indonesian rupiah ended Wednesday at 14,575 after trading in a 14,575 to 14,800 range during the session, according to DZHI data. Nymex WTI crude oil futures for December edged up 0.02 percent to US$61.68 a barrel by 8:00 A.M. SGT, while ICE Brent crude oil futures for January were down 0.08 percent at US$72.07 a barrel at 6:58 A.M. SGT, according to Bloomberg data.